Henry Percy, 4th Earl of Northumberland KG (c. 1449 – 28 April 1489) was an English aristocrat during the Wars of the Roses. After losing his title when his father was killed fighting the Yorkists, he later regained his position. He led the rear guard of Richard III's army at the Battle of Bosworth, but failed to commit his troops. He was briefly imprisoned by Henry VII, but later restored to his position. A few years later he was murdered by citizens of York during a revolt against Henry VII's taxation. Percy was the son of Henry Percy, 3rd Earl of Northumberland, and his wife Eleanor Poynings, daughter of Sir Richard Poynings (d. 10 June 1429). His father was first cousin to (among others) Edward IV of England, Anne, Duchess of Exeter, Edmund, Earl of Rutland, Elizabeth, Duchess of Suffolk, Margaret of York, George, Duke of Clarence, and Richard III of England. Percy himself was second cousin to (among others) Elizabeth of York, Edward V of England, Richard, Duke of York, Arthur Plantagenet, 1st Viscount Lisle, Margaret Pole, Countess of Salisbury, Edward, Earl of Warwick, and Edward of Middleham. Both Perkin Warbeck and Lambert Simnel claimed to be his second cousins. His father was loyal to the House of Lancaster. His wife, Maud Herbert, had in fact been first betrothed to Henry of Richmond, who would usurp the throne in 1485 and become Henry VII. He was killed in the Battle of Towton on 29 March 1461. The earldom of Northumberland was forfeited to the victorious Yorkists. The adolescent Percy was imprisoned in the Fleet Prison. He was transported to the Tower of London in 1464. In 1465, John Neville was named Earl of Northumberland in his place. Percy eventually swore fealty to Edward IV and was released in 1469. He petitioned for the return of his paternal titles and estates to him. He gained support by Edward IV himself. John Neville had to quit his title and was instead named Marquess of Montagu in 1470. However the restoration of the title to Percy was delayed by the Parliament of England until 1473. He was made a Knight of the Garter in 1474. For the following twelve years, Percy held many of the important government posts in northern England, such as warden of the east and middle marches, which were traditional in his family. He commanded the Yorkist reserve at the Battle of Bosworth Field on 22 August 1485. Percy never committed his forces to the battle. His inactivity played an important part in the defeat and death of Richard III. Historians suspect him of treason in favour of victor Henry VII of England, although there is an alternative theory that his forces, placed behind those of King Richard, were in no position to take part in the battle before Richard was killed. Percy was arrested along with Ralph Neville, 3rd Earl of Westmorland and Thomas Howard, 2nd Duke of Norfolk. He was nominally imprisoned for several months but swore allegiance to the new King. Henry VII released him on terms of good behaviour. Percy was allowed to retain his titles and lands as well as being allowed to return to his old posts, and was in fact sent on diplomatic missions for the crown, something that would not have occurred had Henry VII not trusted him implicitly. Henry Percy, 5th Earl of Northumberland (14 January 1478 – 19 May 1527), who married Catherine Spencer. Alianore Percy, Duchess of Buckingham (d. 1530), wife of Edward Stafford, 3rd Duke of Buckingham. Sir William Percy (d. 15 September 1540), who married firstly Agnes Constable and secondly Margaret Soothill, widow of Sir John Normanville. 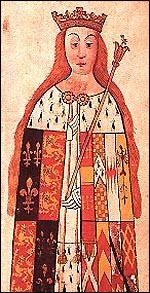 Josceline Percy (1480–1532), who married Margaret Frost. Anne Percy, Countess of Arundel (27 July 1485 – 1552), second wife of William FitzAlan, 18th Earl of Arundel. In April 1489, Percy held temporary residence in his estates of Yorkshire. Henry VII had recently allied himself to Anne of Brittany against Charles VIII of France. Taxes rose to finance the military action. Sir John Egremont of Yorkshire led a riot in protest at the high taxation, known as the Yorkshire rebellion. Percy was targeted by the rioters as he approached the city and slain on 28 April. He was buried at Beverley Minster. ^ Oxford Dictionary of National Biography, accessed 3 Dec 2010. ^ Richardson III 2011, pp. 395-6. ^ Tait, James. "Henry Percy, Fourth Earl of Northumberland (from the Dictionary of National Biography, 1895)". Luminarium. Macmillan & Co. (original); Luminarium (web). Sir Edward Poynings KG was an English soldier, administrator and diplomat, and Lord Deputy of Ireland under King Henry VII of England. John FitzAlan, 6th Earl of Arundel, 3rd Baron Maltravers was an English nobleman. The Fitzalan Chapel is located within the eastern end of the church building constructed on the western grounds of Arundel Castle. This church building is one of the very few church buildings that is currently divided into two worship areas, one Catholic and one Anglican, with the western side of the church building occupied by the Anglican church of St Nicholas. The Catholic chapel, now the private mausoleum of the Dukes of Norfolk, is a Grade I listed building.